Savage kills (if you can get the uncut version). Made for fart sniffing environmentalists. Prophecy (1979) starring Talia Shire and Armand Assante. Directed by John Frankenheimer. If you know me, you understand my fasciation with animals gone big and/or murderously insane. Hell, half of what I write is based on that lovely little horror sub-genre. There are pivotal movies from my childhood that made me the way I am (and damn you, Hollywood!) like Empire of the Ants and Food of the Gods. Well, you can add 1979’s PROPHECY to the list. I originally saw this on a double bill with Jaws in the rundown theater around the block from my grandparents’ place. I think it was the first time I saw a person’s head get ripped off in a movie, and that sealed the deal. On the walk home, we stopped at the stationery store that carried new paperbacks and the novelization for Prophecy was on the rack. My father bought it without my having to ask. What a strange novelization to be one’s first, but that’s life. This movie would be right at home today with everyone fretting about global warming and our impact on the planet. As George Carlin once said, the planet made people just so we could make plastic. Once it has enough, we’re not needed anymore. 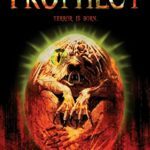 Filmed in Canada but set in Maine, Prophecy is about the environmental impact of an evil papermill that’s spilling poison into the water table. We all know what you get when you mix toxic chemicals with forest critters, right? You betcha. The flora and fauna are being deformed, made larger and angrier. The kingdom of the forest freaks is ruled by a large, man-killing creature that the Native American locals call the Katahdin, a nature spirit with a lust for revenge. Well, this killer ain’t no spirt. 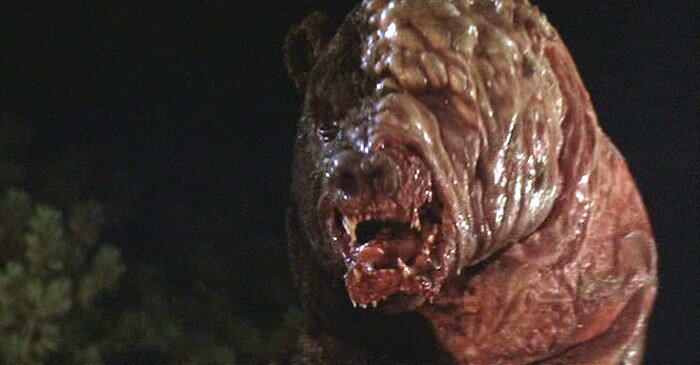 It’s a kinda fleshless bear that looks like something out of a David Cronenberg daydream. With one swipe of its massive paw, you’re one dead mother. I loved the kills, and as a wee one, I didn’t care how awful the practical effects looked. Viewing it now as an adult, or so my driver’s license says, the body count isn’t nearly enough to tickle my ivories. However, when the suspense and action kicks into gear, it is great 70s cinema fun. Plus, it has Talia Shire (yo Adriene!) hiding her pregnancy from her man and my favorite actor name to say in all the world, Armand Assante. Campy overacting abounds, which will give you a chuckle or two. And you just know that Shire’s baby, conceived in this toxic environment, isn’t gonna be close to normal. In fact, it might be deranged enough to be a Final Guy. If you’re looking for some hard science, look elsewhere. This is a throwback to a simpler, better time when people just wanted to sit back and be entertained by a hideous, killer bear. Jaws on land, they were calling it back then. That may have been overstating things just a bit. The movie poster, however, is killer. One of my favorites of the 70s. The shocker is that this was helmed by legendary director, John Frankenheimer, who brought the world The Manchurian Candidate and Black Sunday. He was also responsible, if anyone can be held responsible, for 1996’s Island of Dr. Moreau, which has to be seen to be believed. In fact, a perfect home double feature would be that paired with the documentary on the making of the film, Lost Soul, which I believe can still be found on Netflix. The shoot for Prophecy didn’t exactly go as planned and budgets were cut severely. Frankenheimer later admitted he was an alcoholic at the time which didn’t help matters any. No matter, this little monster movie impacted lives and helped breed a new generation of horror hounds. Just don’t confuse it with Christopher Walken’s angles and demons battle royale, THE Prophecy.